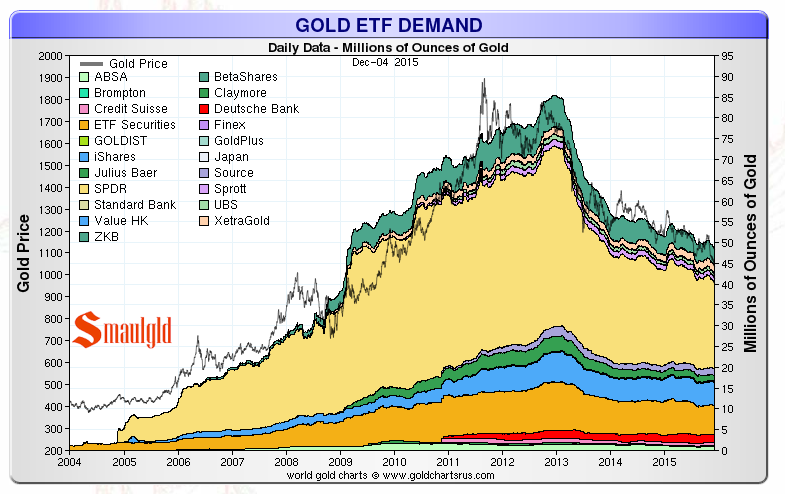 Is there a Gold Shortage? 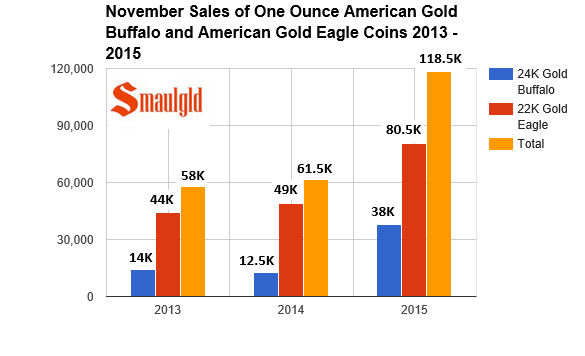 Sales of 22K American Gold Eagle and 24K American Gold Buffalo coins surge in second half of year and November. The big story at the U.S. Mint in 2015 was the surge in sales of American Silver Eagle coins causing the Mint to institute purchase allocations for their Authorized Purchasers that have lasted all year. The Great Silver Shortage of 2015 became evident in late May and early June when the U.S. Mint suspended order limits at the end of May. The lifting of the suspension kicked of a fury of American Silver Eagle buying by Authorized Purchasers. Soon, however, the U.S. Mint had to reverse their decision to allow unlimited buying of American Silver Eagles and to reinstitute purchase allocations. Despite these allocations, and a production halt of twenty days in July, sales of American Silver Eagles set monthly records in June, July, August and November. 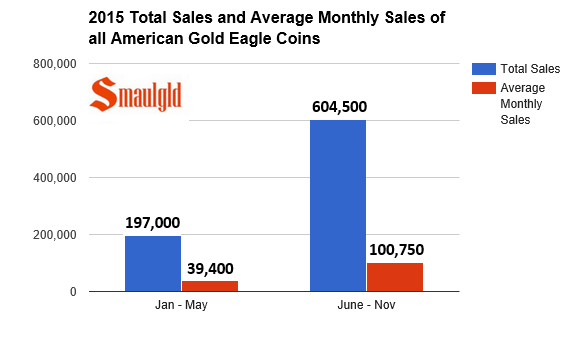 Sales of American Gold Eagle coins had been weak through the spring of 2015. Then in June, sales of all sizes of American Gold Eagle coins, like their American Silver Eagle counterparts, began to surge. 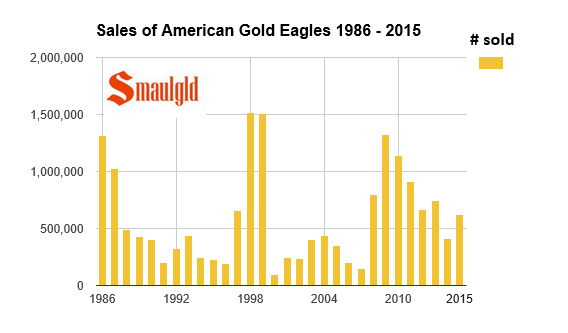 The overall sales totals for one ounce American Gold Eagle coins were mediocre. Seventy eight percent of 2015 sales of one ounce American Gold Eagle coins took place from June to November as sales increased 207 percent from the period of January to May 2015. U.S. Mint November gold sales were about twice as high in 2015 as they were in 2013 and 2014. On November 24, 2015, the U.S. Mint announced that had sold out of one ounce American Gold Eagle coins and would produce no more for the year. The U.S. Mint has also stopped producing the one tenth ounce and one quarter ounce American Gold Eagle coins, but is still taking orders for one half ounce American Gold Eagle and one ounce American Gold Buffalo coins. The U.S. Mint will begin selling the 2016 dated American Gold Eagle coins on January 11, 2016. Why the sudden production halt? 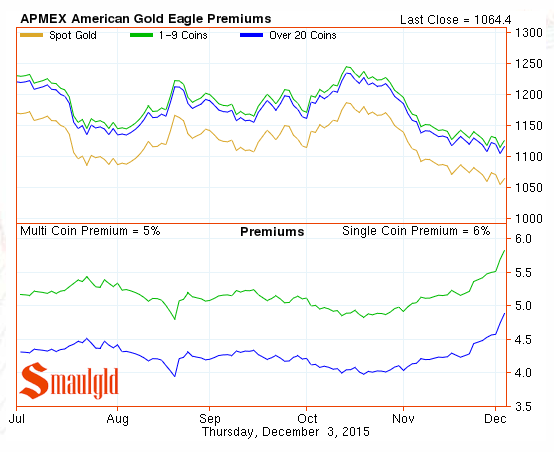 In reaction to the American Gold Eagle production halt, premiums on American Gold Eagle coins began to rise after remaining relatively constant all year. Earlier in the year premiums on American Silver Eagle coins doubled in reaction to the U.S. Mint’s production halts and tight allocation of sales to its Authorized Purchasers. The U.S. Mint introduced the 24K American Gold Buffalo coin in 2006. It has undersold its 22K counterpart, the American Gold Eagle coin, every year since it was introduced. 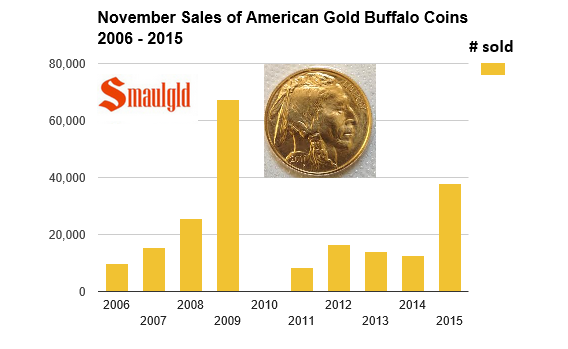 American Buffalo gold coin sales also began picking up steam in the second half of 2015, peaking so far at 38,000 in November, more than three times the 10,500 sold in October and the 12,500 sold in November 2014. 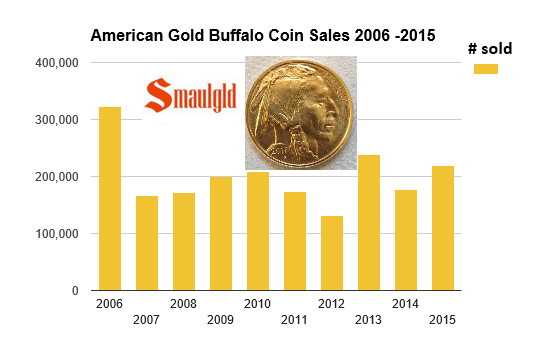 Sales of American Buffalo gold coins are up 27% in 2015 through November from last year’s sales through the same period. Sixty six percent of American Gold Buffalo coins sold in 2015 were sold in the five months from June to November. November sales of American Gold Buffalo coins were the highest in the coin’s history, other than the 67,500 sold in November 2009, when the entire year’s production of 200,000 coins was minted during the months of October through December. We have often noted the movement of gold from west to east. 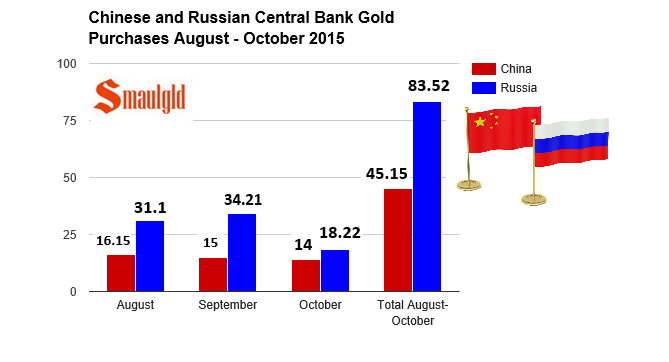 Demand for gold in Russia, China and India remains strong. 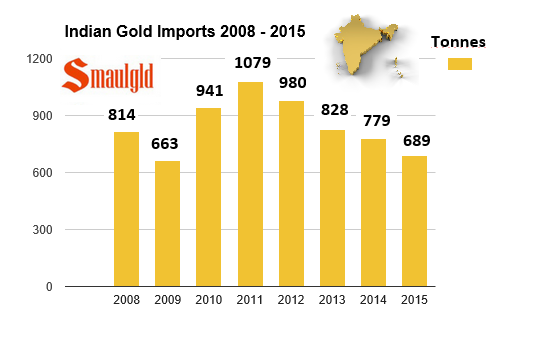 This demand is satified in part from exports of gold from western nations, including the United States. In Gold and Silver Price Manipulation, we noted the possibility that part of the eastern demand for gold was being met through the raiding of the Gold ETFs. To illustrate how little gold the west appears to have, take a look at the just 120,000 ounces of gold that are available for delivery on COMEX to settle trades. 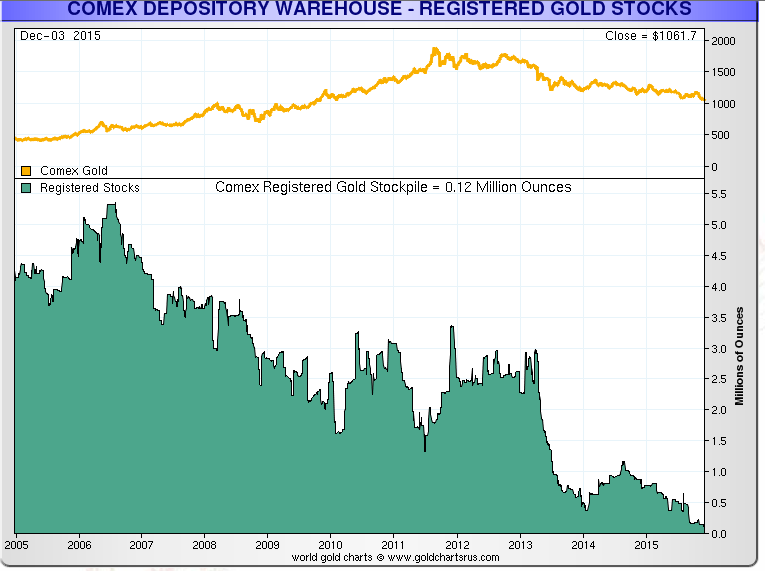 Despite this small amount of gold which serves as the basis for hundreds of potential claims, Comex has not defaulted, nor will it, as western gold traders are content to trade paper contracts rather than physical gold. Did the U.S. Mint halt production of 2015 American Gold Eagle coins on November 24, 2015 because they were running out of gold, or were they just being lazy?